This hike is one of the nicest hikes in Nordmøre. 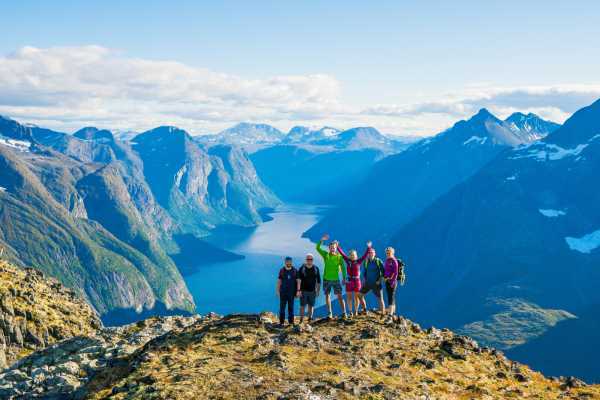 The hike goes through the beautiful Melen top, which already provides a spectacular view over the Atlantic Ocean, the Atlantic Ocean Road and the mountains in Fræne municipality. After Melen you can continue your way to Sjurvarden which gives you an even closer look at the Atlantic Ocean. The hike starts from the lake Gådalsvannet. The lake lies between Eide and Vevang and it is easily accessible from road 64. There are parking places by the lake. The trip is marked from the beginning. First, you will cross a river then follow the marked path on the eastern side of the mountain. After the first kilometer the real climbing and uphill part starts. You will need good shoes and physical shape to get all the way to the top. Make sure that you stay on the marked path.